Are you planning on bringing your emotional support animal on your next flight? Although the process may seem complicated, we have a few tips you can use to prepare your dog for flying, from getting a health certificate from the vet to checking airline rules for flying with a support animal. To learn more, follow the helpful tips below! Most airlines require you to get a health certificate for your pet or support animal to ensure they’re healthy enough to fly. After all, if something happens to your dog in the air, it’s their responsibility. Fortunately, health certificates aren’t very expensive, typically last at least a week, and offer an opportune time to review your dog’s health before boarding your flight. To show other passengers that your dog is “on the job” and shouldn’t be interrupted, you should purchase an emotional support dog vest. Also, it’s a reminder to the airport staff that your dog shouldn’t be sent off with other pets. Instead, it guarantees them a seat right next to you on your flight. Fortunately, support dog vests come in a range of styles and colors, so you have plenty to choose from. Although your emotional support animal should have less anxiety than you while flying, it’s never a bad idea to purchase calming supplies from a local pet store before your flight. This way, if you notice your support dog getting stressed out during takeoff or turbulence, you can supply them with calming aids, whether it be in treat form or via a calming collar. It’s incredibly important that before your flight, you check the airline rules for flying with a support animal. Individual airlines may restrict the type of support animal you can bring and whether or not you need specific forms, such as an animal health certificate. Although you should be able to fly with your emotional support dog, it’s always best to double check if your airline has any restrictions. There are quite a few steps you should follow to prepare your emotional support dog for flying, from purchasing an emotional support dog vest to checking the airline rules for flying with a support animal. 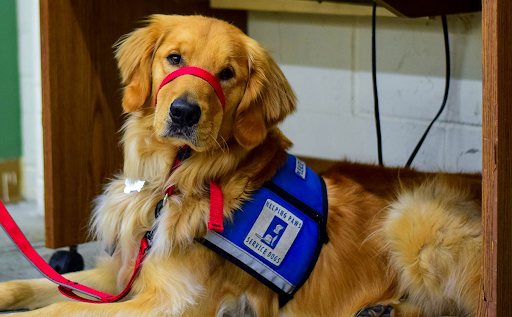 Hopefully, by following this short guide, you can have an easier time getting your support dog ready for your upcoming flight this spring. To get started today, make sure to get a proper health certification for your support dog and check to see if your airline has any restrictions for flying.